One of my favorite things about being a hopelessly addicted rock climber is how often I am able to immerse myself in beautiful and majestic landscapes. Add to that the unique feeling of experiencing those landscapes from unusual vantage points often while trying to perform feats of mental creativity combined with physical strength and exactitude....and yeah...I love climbing!!! Last fall my buddy Nate Popik was road tripping and offered up the idea to fly out and meet him for just such an experience on a route I've always wanted to do. Moonlight Buttress in Zion National Park. It follows a singular finger crack system for 1200 ft up the center of this orange buttress looming over the canyon and has six 5.12 ptiches in a row making up the meat of the route. Our first day in Zion we walked to the top of the route and rappeled the whole line, climbing on the harder pitches to get used to the unique style of the desert cracks. 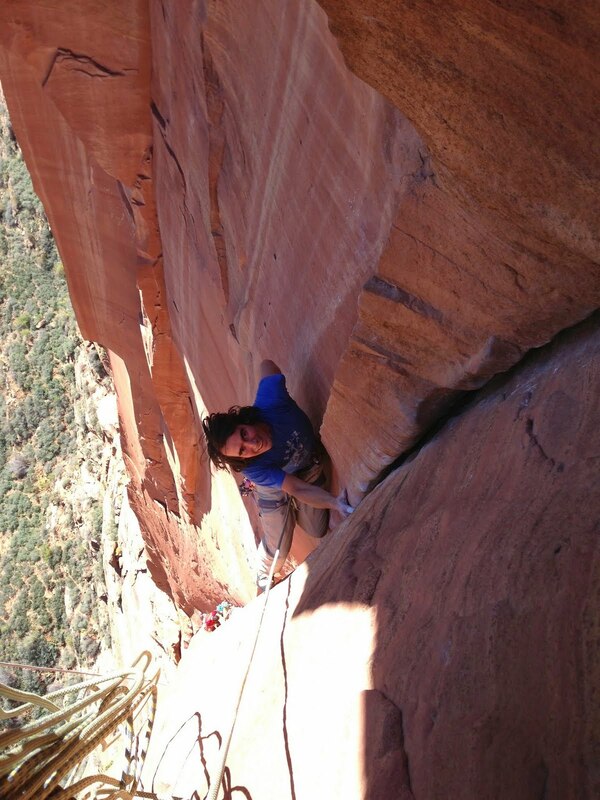 Nate had been on the route before and warned that the supposed 5.12d crux corner pitch was not really the crux. Two of the other pitches that are graded easy 5.12 sport ring-lock/rattly finger sized cracks that proved to be much harder for us. There really isn't anything like that in New England and I was surprised at how hard those sections felt. After getting the route worked out to the point we thought we could redpoint it, of course it started raining. So we retreated to lower elevation and went limestone sport climbing at the Cathedral and Wailing walls outside St George. Though it was a bit cold, as these walls see no sun in early November, the climbing was great. 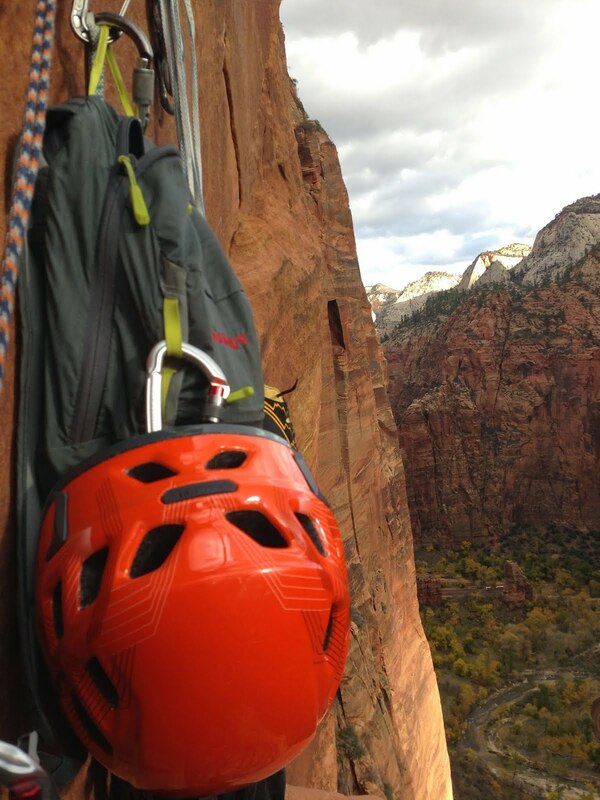 After the fragile sandstone in Zion dried out we went back for a redpoint attempt. We swapped leads all the way up and took no falls. And true to Nate's words, I lead the "crux" layback pitch without too much difficulty but the following flared chimney to corner pitch was a bit ugly. Luckily that was Nate's lead, which he did in fine enough fashion, didn't totally hike it but wasn't waging all out war either. 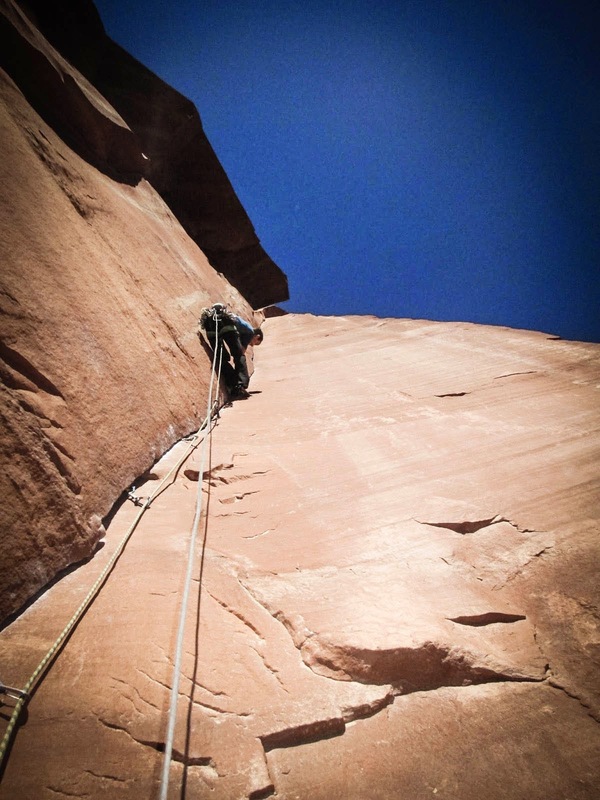 For me however, my "easy" task of seconding the pitch without falling was without a doubt one of the hardest "successful" fights I've ever had on a pitch of rock climbing. You start the pitch in a wide flared chimey which isn't too bad. Then you get into a position that you stay in for the next 40 feet. Right hand thumbs down ringlocking in the crack above your head, left hand thumbs up rattly finger stuff at your tummy, right leg desperately knee scumming against the right side of the flare with right foot pressing on the left side, and left leg below straight in trying to wedge in the overhanging rattly finger crack. From this position not one of my four appendages felt solidly connected to the rock. Yet to go up I had to move each of them one at a time without being able to cop any kind of a rest at all for my weakening appendages, nor for my cramping core muscles, hyperventilating lungs or oxygen starved -slowly dimming into primal survival mode- brain cells. Due to my poor technique, I had given myself a full body terminal death pump so severe I was near to blacking out. I was, however, over halfway up the pitch and really, really didn't want to fall off and have to lower back to the previous belay and rest for a hella long time and then try the pitch all over again. So I somehow willed myself not to fall and made it to the point where you can switch from the awkward postion you've been in for 40 feet into a power layback where you can actually shake out an appendage in between each move. When I finally pulled onto the "bivy ledge" ( a sidewalk sized ledge halfway up the route) I was totally nauseous, dizzy and delerious....yet totally stoked on the endorphins ripping through my blood stream from the little mini war I'd just survived.... on top rope:) While I'm sure this pitch probably does feel like easy 5.12 to some folks, for me, the effort I put forth was beyond gradable. Full value!!! belaying off the "bivy ledge"
Overall the Moonlight Buttress is amazing! Mini big wall free climbs don't get better than that!